5 × = 20 Required Please enter the correct value. Brick-and-mortar retail stores are dying, but our new Amazon stock price prediction shows the e-commerce stock will continue to outperform traditional retailers. Stores like Sears Holding Corp. (Nasdaq: SHLD) (-23%), Kohl's Corp. (NYSE: KSS) (-14%), and Macy's Inc. (NYSE: M) (-9%) are all tanking in 2017. On the other hand, Amazon.com Inc. (Nasdaq: AMZN) stock is up 12% year to date (YTD). And our newest Amazon stock price prediction shows there is plenty of room to grow. 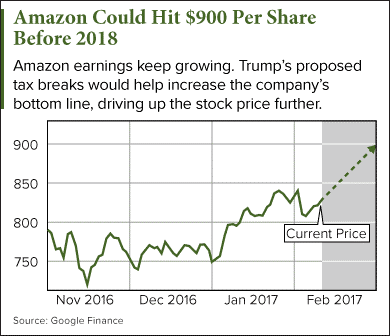 Money Morning Options Trading Specialist Tom Gentile just released a new Amazon stock price prediction and set his price target at $900 on Feb. 1. Since he released his target, we've received even more bullish news on the stock. Amazon posted a better than expected earnings report Feb. 2. The company showed a 27% increase in revenue, led by its e-commerce and cloud-computing divisions. Not only did Amazon grow revenue, its net income was up 302% year over year. That was mostly due to cutting costs. Analysts expected earnings per share (EPS) of $1.35 for Q4. The company posted $1.54 EPS for the quarter. For the full year, AMZN reported earnings of $4.90. Next year, analysts expect that to climb to $7.29. The company also saw major growth in its list of offerings. In 2016, the company released over 1,000 new services/features. That is an increase of more than 25% from 2015. A notable addition to the lineup in 2016 was Wickedly Prime. This service is available to Prime members and is a private-label line of food and beverages. Amazon is looking to continue expanding its offerings this year as well. Last Friday (Feb. 10) the company announced it will be offering its own line of bras. These moves into grocery and clothing lines show how Amazon is going directly after traditional retailers.